Your cells form aggregates in suspension cell cultures, making the preparation for flow cytometry (FACS) and routine cell passage assays difficult, if not impossible. This is where AccuMax can help you. AccuMax is a gentle and reliable detachment and dissociation reagent. Aggregates will be broken down without damage to the surface epitopes of the cells, and your cells can easily be prepared for experimental measurements. Your results will be reproducible and your data reliable. AccuMax is a cell dissociation solution containing proteolytic, collagenolytic and DNase enzymes. It is a ready to use non-mammalian, no-bactérial replacement for all applications of trypsin and collagenase in tissue dissociation, cell counting, and dissolving cell clumps such as spheroids. AccuMax is useful for increasing the accuracy of cell count. Since AccuMax like Accutase (ACC-1B) does not affect the surface epitopes of the cells it is therefore ideal for FACS Analysis where even small changes in the cell's properties may have great impact on the results. 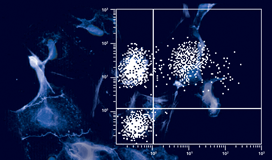 Aggregation is a major problem in working with eukaryotic cells in suspension cell culture. The use of AccuMax enables reliable aggregate resolution and efficient recovery of individual cells. Cell counts are much more accurate and flow cytometric analyzes are less prone to errors. This gives you reliable data and reproducible results.